iPhone enables the users to take beautiful photos with high pixel and many iPhone users may meet the problem that they cannot find a good photo printer to print the photos with high quality when they are going to hang the pictures on the wall. There are many photo printers on the market, but not everyone can be compatible with the iPhone. So here we prepare a list of good and wonderful iPhone photo printers for you in order to save your time. Polaroid Grey Label GL10 Instant Mobile Printer can print good-looking photos with high quality. Besides it can optimize the image quality automatically and delivers the photos with under Bluetooth connections. It has high compatibility so that it can support various mobile phones wirelessly and can be compatible with Macs and ZINK Z3X4 photo. The disadvantages of the machine are that the printing under the Bluetooth connection is slow. By the way, you are able to buy it in Amazon. HP Photosmart 5520 e-All-in-One can deliver the photos with high-quality and the photos it printed remain attractive after many years. This printer is welcomed by many people. The powerful printers support to work through the cloud, Airprinting and wireless connections. It supports to print the lap-quality photos from various smart phones and tablets. What's more, it can print the high-resoution photos at a rather high speed. You can get the printers on App Store. The Smartphone Photo Cube Printer can give you the beautiful colorful photos with amazing high-quality without a computer. It supports to print the jpeg files via dock or USB port. The photos of size it can print include 4"x6", 4"x11.2" and 4"x16.4". The printed photos are coated to protect the photos from fingerprints. This printer is the best choice for home use and travels because it is light and durable. Besides, it is easy to operate. You can find the printer in Sharpimage. Epson Expression Premium XP-610 Small-In-One Printer is also the excellent printer. It is extremely powerful and also small so that you can carry it anywhere. It supports 2-sided printing automatically. The machine has a 2.5" LCD touchscreen display and can print photos from iPhone or iPad. But the disadvantages of the printer are that the paper capacity is slow. You can buy the printer on Epson or Amazon. Canon SELPHY CP910 Black Portable Wireless Compact Photo Color Printer is the thermal dye 4-by-6 dedicated photo printer that can support to print the borderless photos in credit card and postcard sizes from iPhone or other smart phones and tablet directly. By the way, the machine can also be compatible with a wide range of Ink/Paper set. You can get this on Amazon. Fujifilm Instax Share SP-1 is a portable photo printer with a small size but it can deliver photos with high quality. The printer is easy to use and you can use it to quickly print the pictures from iOS or Android smart phones via Wi-Fi. The machine can print photos with 1.75"X2.47". What's more, the printer is simple to use and easy to set up. However, the machine is more expensive than other printers and printed photos have large borders. You will find it in Amazon. 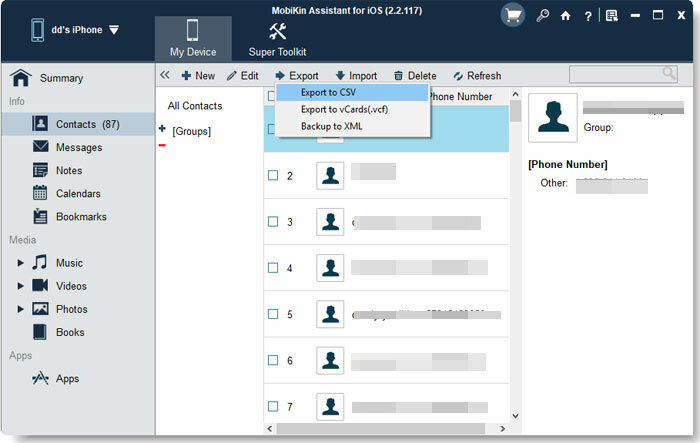 Bonus: If you want to manage the photos on the iPhone, you can use MobiKin Assistant for iOS (Windows/Mac) which enables the users to transfer photos and many other files like contacts, SMS messages from iPhone 6s/6s plus/6/5s to computer easily. You can download the free trial version by clicking the icons below. The software will display all the files on the window as many categories like the screenshot below.